10 Questions With is a regular feature where we normally put a variety of quick-fire questions to manufacturing leaders and role models to get to know the people behind manufacturing success in the UK. 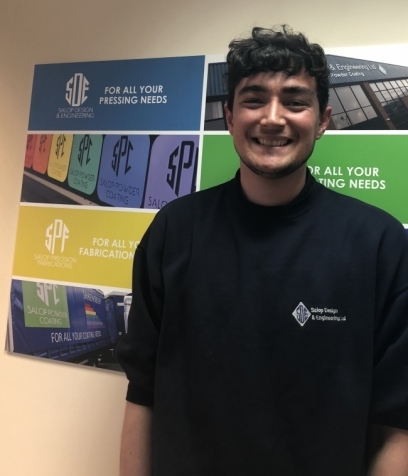 To recognise National Apprenticeship Week and the future talent of British manufacturing we asked Alex Malam, to share his thoughts. 1 – How did you find out about the industry? Tell us a little about how the apprenticeship opportunity came about? I was 6 months into an engineering course at a college when I decided I wanted something more hands on. Using the government website I was able to find this apprenticeship opportunity with Salop Design. 2 – Why was an apprenticeship the right route for you? Did you explore any other career options? I feel it was the right route for me because it mixes both the hands-on approach with the technical aspect giving you the experience to go alongside your qualifications. And with the ability to earn and learn, and get to know a company inside out. 3 – What does a typical day as an apprentice look like? A typical day would be shadowing another member of staff until you are competent enough to undertake these tasks by yourself. Learning from an experienced Mentor is one of the very best ways to gain skills. 4 – What is your favourite thing about being an apprentice? The favourite thing for me is the variety of work. A lot of problem solving is involved meaning you are always engaged. It is also very rare that I will have the same day twice. I get experience in all departments of the company, giving me the very best opportunity to learn all the skills I need to start a fantastic career. 5 – What have you found most challenging about your apprenticeship so far? At the start I found getting into the routine was the hardest part, but you quickly settle into that. There should be more talk at school, and within education, on the skills needed to actually get into work, and what to expect when you get there. 6 – Tell us about a project you’ve been working on recently. A recent project I have been working on is the designing, making and fitting of drawers for the progression presses. These have been installed to aid production. Saving time and supporting the Customer. 7 – Apart from your day-to-day role, what other areas of the business or projects have you been involved in? e.g. learnt about other departments, taken part in external events. At the start of the apprenticeship we spent 3 months in different sections of the factory. These included quality, toolroom and maintenance. Allowing me to see all the departments, and let me see where I would want to work. 8 – What’s the best piece of advice or most valuable skill you’ve learnt during you apprenticeship so far? Don’t rush into things, think things through thoroughly and keep work to a high standard. 9 – Do you think apprenticeships are promoted effectively enough to young people? Is there enough advice and guidance available, and how do you think the manufacturing community can continue to encourage more young people to pursue careers in manufacturing? I think schools should encourage pupils to pursue apprenticeships as much as they do with university. I also think schools should do more work experience days so that young people can try out different industries. 10 – What are your plans after your apprenticeship? Where would you like your career to go in the future? After just recently finishing my level 3 I am about to move on to a level 4 HNC. In the future, I would like my career to go onto project management.